The human race has had a love affair with gold for the last 6,000 years. Initially, it was used for ornamentation but quickly developed into a currency, enabling goods to be traded. The first debasement of coinage as a currency took place in Roman times when the gold content was reduced to such an extent during a period of hyperinflation, that the whole economy collapsed. Fast forward about 1,400 years to 1694 and you will find banknotes issued by the Bank of England which were backed by gold and were fully convertible. The convertibility was sustained by gold standards and an agreement between major nations in 1945, called the Bretton Woods Accord, however, the US paper currency was gradually debased until President Nixon abruptly stopped any conversion of the dollar into gold. Paper currency was then created with its "value" determined by government decree. Unease about huge national debts, especially in the southern countries of the Eurozone as well as the United States, has weakened the Euro and called into question the role of the US dollar as a reserve currency. Many central banks around the world have been quietly increasing their gold holdings as a hedge against the possible demise of the US dollar. This book will show you how much gold is being produced on the supply side and how much is being accumulated by central banks as well as by investors on the demand side. Even though the jewellery trade in India and China is still the largest consumer of gold, purchases for investment purposes are becoming increasingly important. This book will help you sort through your investment options so that you can protect yourself in the event of a major world economic or currency crisis. You will learn how to invest in coins, gold bars and wafers. You will then be shown how to invest in gold mining companies and Exchange Traded Funds. The book covers the basics of fundamental and technical analysis of gold mining companies to help you select the best companies and correctly time your purchases. It also shows you how to set up a stock brokerage account. Learn about mutual funds which specialize in gold as well as how to purchase options and trade gold on the futures exchanges. Find out about the major factors which influence the price of gold and determine for yourself whether a gold bubble has developed and is about to burst or whether investing in gold still offers an opportunity to make huge gains. Chapter 18: Don't Believe Everything You are Told! Chapter 20: A Gold Bubble? 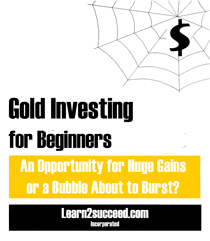 Gold Investing for Beginners: An Opportunity for Huge Gains or a Bubble About to Burst? by: Learn2succeed.com Incorporated: Softcover; 134 pages; ISBN: 978-1-55270-445-5 published in 2012; $19.99.